The below chart is my estimate for pre-tax retirement account amounts by age. I’ve used the standard 401(k) plan, but the numbers encapsulate all pre-tax retirement accounts. These are the amounts you need to comfortably retire after the age of 60. * The Low End column accounts for lower maximum contribution amounts available to savers above 45 and/or lower returns. * The Mid End column accounts for lower maximum contribution amounts available to savers below 45 and/or medium returns. * The High End column accounts for higher maximum contribution amounts available to savers under the age of 25 and/or higher returns. * After a couple years, one maximizes their contribution every year to their 401k plan without fail. * The rate of return assumptions are between 0% – 10%. * Company match assumption is between 0% – 100% of contribution. As of 2018, the total maximum 401(k) contribution by the employer and employee is $55,000. The maximum employee contribution is usually $18,500, but there is a $6,000 employee catch-up contribution if age 50 or older by year end. * The Low, Mid, and High columns should successfully encapsulate about 80% of all 401K contributors who max out their contributions each year. There will be those with less, and those with larger balances thanks to higher returns and more generous company profit sharing. Now that everyone agrees with my pre-tax retirement amounts, it’s time to figure out what your after-tax investment amounts should be by age. After-tax investments include all stocks, bonds, rental property equity, business equity, and private investments. You could include your primary residence equity if you plan to rent out rooms or sell the property, but a conservative person would not. For those who aspire to retire early, pre-tax retirement accounts should mentally be considered “bonus money.” If the money is there when you turn 60, wonderful. If it’s not, no big deal because you didn’t count on it to retire on in the first place. Maxing out your 401(k) is something you should just do as soon as possible for as long as possible. It reduces your taxable income and often has a company match or profit sharing component. Never pass up free money. Given after-tax investment money is what is required to generate passive income and live a comfortable life in early retirement, it is therefore logical that after-tax investment money equals a multiple of pre-tax money. The greater the ratio of after-tax money to pre-tax money, the easier it will be to survive in retirement without a job. Have a look at my base case after-tax investment amounts chart, which will allow you to comfortably retire between 40 – 50 if you so choose with a safe withdrawal rate of between 3% – 5%. This is the base case scenario. I’ve provided an aggressive scenario and a conservative scenario as well. Your 20s: The hardest part about achieving financial independence is getting started. Your 20s is a time of uncertainty. You’re not exactly sure what you want to do, where you want to live, and how you plan to get your finances in order. Maybe you have student loan debt as well. The easiest way to get started is to read your employee handbook and contribute as much as possible to your company’s pre-tax retirement accounts ASAP. Since you have the lowest earnings power, it may be difficult to comfortably max out your 401(k). However, it is important to also build up after-tax investments at the same time. The ideal situation is to max out your 401(k) and then save 20% or more of your after-tax, after-401(k) income. By the age of 30 or after eight years in the workforce, your goal should be to have as much in your after-tax investment accounts as you do in your pre-tax retirement accounts. In this chart, that figure is $150,000 + $150,000 = $300,000. Your 30s: You should hopefully know what you want to do with your life by the time you hit 30 or after eight years worth of work experience. If not, retiring early will be difficult. For this decade, your goal is to get your after-tax investment accounts equal to at least 2X your pre-tax retirement amounts by 40. Once your after-tax investment amount surpasses your pre-tax amounts, you will finally start feeling like early retirement is a possibility. Your 40s: If all goes according to plan, you’ll have accumulated between 2X – 3X in your after-tax investments. In such a scenario, you are free to leave work behind. It’s important not to hit the eject button before you hit at least a 3X ratio (~$1.5M). Otherwise, you’ll likely experience a tremendous amount of anxiety in early retirement, which would defeat the purpose of retiring early. There are plenty of folks who decided to retire in their 30s because it was the fashionable thing to do and ended up decimating their wealth and their relationships. There’s often a lot of financial pressure in your 40s due to kids, aging parents, health problems, and so forth. This is the sandwich decade that must be taken very seriously. Your 50s: If you’ve been wanting to retire, but still haven’t, hopefully it’s because you enjoy your job, enjoy the camaraderie, or are waiting for a meaningful pension that will set you up for life. Retiring in your 50s still feels great because it’s still 5 – 15 years earlier than when the average person retires. We’re also living longer as well. I also stop the chart at age 60 because if you retire after age 60, then you’re retiring at a fairly normal age. If you’re retiring close to 60, there’s really no need to accumulate much more than 3X your pre-tax retirement accounts in after-tax investments because you’ll be able to tap into your pre-tax retirement accounts penalty free and receive Social Security as early as 62. 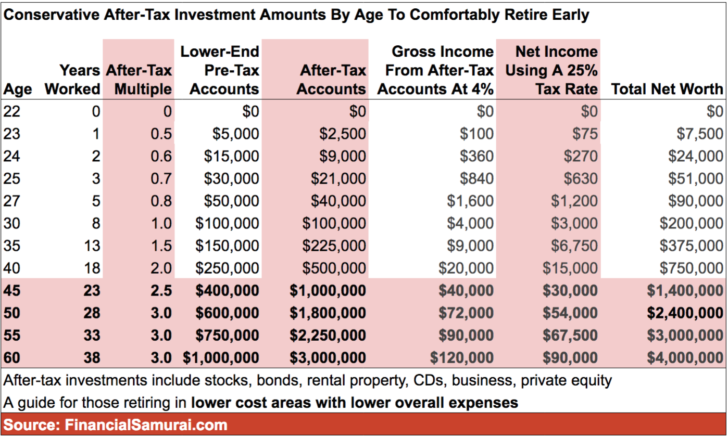 For those who are younger, who don’t feel like the amounts are enough in my first chart, or who have early retirement goals as soon as you graduate from school, below is a more aggressive after-tax investment guide to follow. Higher after-tax amounts are achieved through greater risk-taking, a side business, better returns, and greater luck. This guide will allow you to comfortably retire between the ages of 35 – 45, depending on your level of frugality and responsibilities. Again, these numbers are based on firsthand experience and feedback from other early retirees. 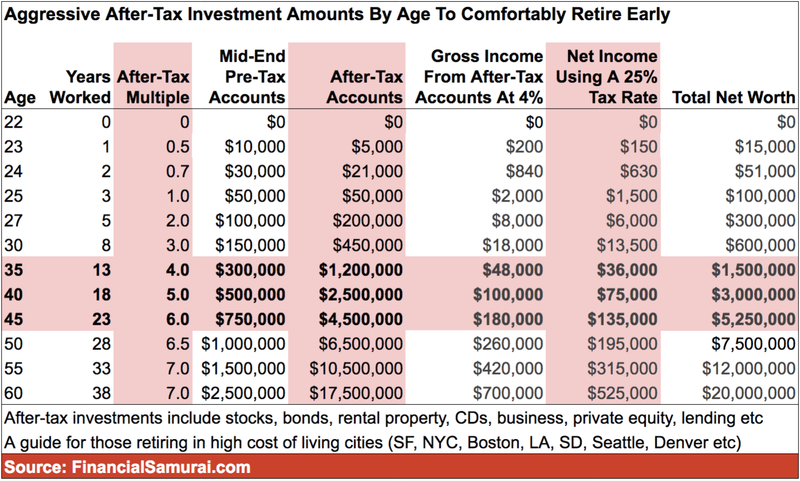 Retiring at 30 (not recommended): Theoretically, a 30-year-old with no spouse and no kids to care for could retire with $150,000 in pre-tax retirement accounts and $450,000 in after-tax investment accounts, especially if they geo-arbitrage to a lower cost area of the country or world. But I wouldn’t recommend retiring so early after spending so much money and time on education. You need more time for your investments to compound. “Lean FIRE” is a difficult way to live if you have aspirations to live a more comfortable life or start a family. Retiring at 35 (not ideal, but doable): By age 30, one should finally gain the confidence and expertise to really start earning an accelerated income. Your 30s is a time for rapid wealth accumulation. If you retire at age 35, you’ll have at least socked away an extra five good years of earnings. But unless you have something you really want to do after retirement, retiring at age 35 also is a little premature. Your $1,200,000 in after-tax investments based on a 4X multiple will only bring in about $36,000 – $60,000 depending on risk. Therefore, you will likely need to supplement that income with part-time work. The good thing is that most people I know who’ve left Corporate America around 35 have easily been able to find things they enjoy doing which also pays them supplemental income. Online freelance work is a trend that is here to stay. If you’ve been able to retire at 35, you should have at least one valuable skill to sell. Retiring at 40 (green light): The closer you get to 40, the more comfortable you will feel with retiring because you’ve not only spent more years working than you’ve spent in grade school and college, you’ve also built up a more robust net worth thanks to more years of compounded returns and savings. After at least 18 years of working, you won’t have as much wonder or regret leaving a job behind. You’ll probably welcome a break from the mundane in order to travel or spend more time with family. With around $2,500,000 in after-tax investments and at least $500,000 in pre-tax bonus money, you have enough to live a relatively frugal life with a family. $2,500,000 will generate at least $75,000 a year risk-free and up to $125,000 a year in income based on a slightly more aggressive 5% annual rate of return. Once Social Security kicks in, you’ll earn an extra $1,000 – $3,000/month in spending money. Conceivably, you’ll never have to touch principal now that the risk-free rate is over 3%. 40 is still young enough to start a business or do some part-time consulting if so desired. Worst case, you can always go back to work as well. If you can hang on long enough, the ideal age to retire is between 41 – 45 to minimize regret and maximize happiness. Having a net worth between $3,000,000 – $5,250,000 should be enough. Regarding the large net worth figures at the end: Getting to $10,000,000 – $20,000,000 by age 60 in my charts seems farfetched. Plenty needs to go smoothly with your job, your investments, or your business. For example, to grow your after-tax investment amount from $5,000,000 to $15,000,000 in 10 years requires annual contributions of $115,000 plus 10% compound annual returns. These large figures should give folks some insight into the power of compound returns over time. As a result of compounding, it’s a mistake to retire before the age of 40 if you don’t have alternative means to earn and invest. Earning your 5th million is much easier than earning your first. At 41, I feel my life has just begun. For those who are willing to retire at let’s say 40, their net worth will likely be capped at around $2,000,000 – $3,000,000 or at least grow much slower as they spend their passive income and potentially their principal. In other words, if you retire early, it’s likely you will give up millions of dollars of future wealth for the freedom you’ll enjoy today. You must be OK with this. Finally, for those who live in a lower cost area of the country, who plan to retire in a lower cost area of the country, and/or who simply have much lower overall living expenses, this guide may be more appropriate for you. In this scenario, I would not retire before the age of 45 and without at least a 3X multiple. 82% of Americans retire after the age of 61. Therefore, if you somehow feel irked by my money targets, it’s understandable because most Americans won’t retire early. Just remember that this is a financial independence site that focuses on living one’s best life as soon as possible. The Financial Samurai community does not strive to be average. Since 2012, I have met only a handful of people who retired early and then ended up going back to work full-time because they couldn’t find something meaningful to do with their free time. The second most common reason for going back to work is usually a miscalculation of the amount they needed to feel financially independent, hence the purpose of this post. Those who miscalculated tend to skew under age 35. 1) Passive income is everything if you truly want to live a carefree retirement lifestyle. Shoot to have as much in after-tax investments as you do in pre-tax investments by age 30. 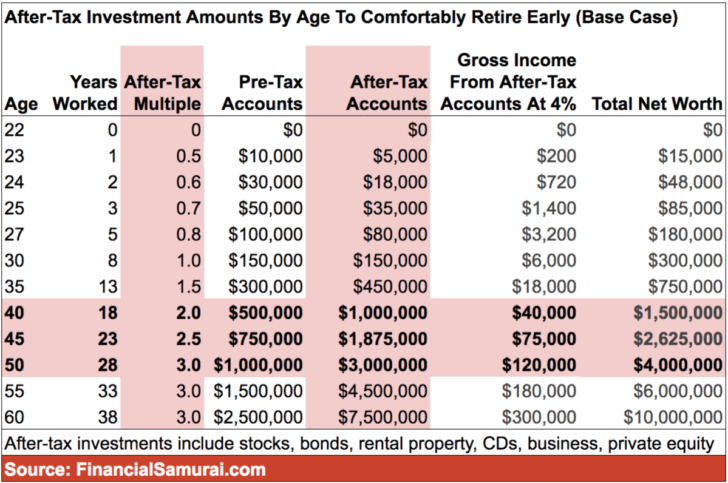 Don’t get to a 1X multiple because you have so little in pre-tax investments. Get to at least a 1X multiple because you have been aggressively contributing the maximum to your pre-tax accounts in your 20s. 2) 40 years old with a 4X multiple is ideal. Don’t retire before you hit at least a 3X multiple. Ideally, you’ll be able to get to a 4X multiple ($1M – $4M in after-tax) between ages 35 -50. If you do, there’s no reason to continue working at a job you don’t absolutely love. It is OK to take some risks with a new job that pays less, start an entrepreneurial endeavor, or even completely retire and do nothing. However, after about three years of doing nothing, you will get bored and want to do something productive again. 3) Earning supplemental income in early retirement is extremely common and beneficial. Almost everybody I know who has retired early found something they love doing part-time that generates a little to a lot of income. The younger you retire, the higher the likelihood you’ll end up generating supplemental income that drastically extends the life of your financial nest egg. You can retire with less than my guide suggests if you have other means of earning extra income. Every $10,000 in supplemental income you make equals $250,000 in capital at a 4% withdrawal rate. 4) Bad things that cost money tend to happen in higher frequency the older you get. Not only must you take care of yourself, you may have parents and children to take care of as well. Therefore, believe the figures in the chart are not only realistic, but necessary for those who wish to retire early comfortably. Do not extrapolate the returns of the past 10 years into the indefinite future. If you do, this will be one of your biggest financial mistakes. 5) Focus on the after-tax columns. If for whatever reason your pre-tax retirement accounts are short of my targets, then simply focus on the after-tax column in both of my charts as an amount to shoot for by age. As an early retiree, you won’t be pilfering your pre-tax retirement accounts anyway, so they don’t really matter unless you have some serious financial emergency. 6) Make a judgement call on the amounts in my guides based on your overall living costs. If you plan to retire in places like San Francisco, Manhattan, and Honolulu, you may want to focus on the more aggressive guide. If you plan to retire in places like Omaha, Des Moines, Dallas, and Ft. Lauderdale, the conservative guide is more appropriate. If you and your life partner are a team, then my guides can be the combined total amounts for both of you. If you plan to retire between 55 – 60 years old, you most likely do not need as much as my charts indicate. My charts are guides, not early retirement law. 7) The longer you work, the less you need. Although your net worth starts to skyrocket the older you get due to the power of compounding, you ironically need less money the later you retire. People suffer from the “one more year syndrome” all the time due to this fact. Therefore, the hardest part about retiring early is overcoming the mental fear. If you follow the numbers in my guide, you will more easily handle the psychological aspect of the transition. 8) A safe withdrawal rate is between 3% – 5%. The risk-free rate of return (10-year US treasury bond) is now roughly 3%. Therefore, you can withdraw 3% from your after-tax investment accounts every year and never touch principal. Keep the maximum withdrawal rate at 5% if you don’t plan on making any supplemental income in retirement. By the time you turn 60, your pre-tax retirement accounts will provide you an extra financial boost if necessary. For those curious, at 34, I left with a multiple at around 4X. Yes, it was a little scary to leave so young. But with a severance package and only myself to provide for at the time, I wasn’t overly worried in 2012. The goal after leaving work was to build Financial Samurai and accumulate enough in my after-tax investments to generate a $200,000 passive income stream to provide for my potential family. Now that I do have a family, I’ve discovered that due to inflation, a passive income amount closer to $300,000 is more appropriate if we are to remain in San Francisco. It has definitely been a challenge to try and generate more passive income, especially now as a stay at home dad. If I hadn’t received a severance package, I most likely would have worked for three more years and saved at least 50% of my income to boost my after-tax investment accounts to 5X. Thankfully, it’s been a raging bull market since I left, so my multiple has continued to expand. Leaving a steady paycheck is not easy, especially if you’ve had one for decades. But if you hit these target multiples, I promise you that everything will turn out all right in the end. If things are not all right, then it is not yet the end! Retire earlier by tracking your finances: Sign up for Personal Capital, the web’s #1 free wealth management tool to get a better handle on your money. After you link all your accounts, use their Retirement Planning calculator that pulls your real data to give you as pure an estimation of your financial cash flow as possible using Monte Carlo simulation algorithms. They’ve got an excellent investment checkup feature to help you make sure you’ve got the proper risk exposure. What you measure can be optimized. Your charts are for high living areas. We live in a low cost area. Our monthly living expenses are <4000/month including housing, meals, transportation, and health insurance. Your plans also neglect any pension and possible Social Security Income. My planner and I figure that I only need $1M and a part time job to retire at age 60 and be funded to age 90. This is a far cry from the $4M you list. People need to be realistic about their expenses and their sources of income in retirement. Have you retired yet? If not, life might be different than you imagine. Also, look at the lower end column if you live in a LCOL area. I’m a recent reader and have loved scouring your posts for the past few weeks; thanks so much! Great article! I have access to partake in the mega backdoor. I am curious as to your thoughts on whether you think this is a good option for early retirement? On one hand it allows for more tax deferred gains but makes it harder to hit the thresholds you list above in after tax accounts. I FIRE’d at 53, my wife is 64, and we were able to do it with a combination of pre-tax savings and real estate. During our highest earning decade, each year we would max out my wife’s 401K on a catch-up-basis and contribute to earn the max matching contribution for mine. (our highest combined income was around $250K/yr.) With both of us working and saving and getting stock in our Fortune 500 companies, and a big increase in our residential and rental property value, we grew our net worth from about $100K to $2M+ in just over 10 years. For us, rental real estate has been the best performing asset since it consistently spins off cash, and [in our case] increases in value over time. We were able to accumulate enough savings to buy a few properties in ’09, when the market tanked, using some of our stock and 401K savings as a down payment and financing the rest. Buying real estate is the definition of financial leverage for the non-wealthy. Mostly with OPM, we doubled the value of our invested capital in less than three years and developed a consistent stream of revenue for retirement. It is the real-estate equivalent of buying stock on margin, using your local banker as the financier. You share the risk and keep all the profits. Just as with stock, timing is everything in Real Estate too. Honestly, even with these investments, I don’t think we would have been able to retire early in San Diego on that alone. We were also super fortunate to inherit some property from our parents that grew our portfolio by an additional four rental homes in N.C. (about $1.1M) and $350K cash. This is what got us over the hump for early retirement in beautiful North County. I learned about real estate from my Dad who lucked into buying some rental property in California in the 70’s. It became the basis for my parent’s retirement and eventually funded the purchase of several rental homes in North Carolina. 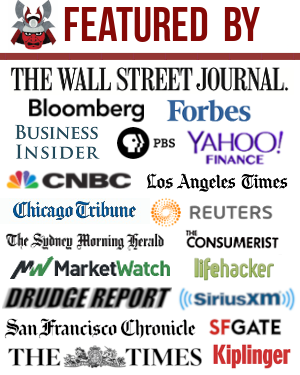 I was the beneficiary of this learning experience and it has been the path, and foundation, of our financial success. The challenge in Real Estate is in getting the best total return on investment over time – the ratio of rent to value – which can vary wildly by market/region. Hence we live in CA and our rentals are in NC. In many markets, the growth of the value of properties is outpacing the increases in rent, lowering the total return on invested capital to below-market rates. The security and monthly return of rental income then comes at a premium. Landlords often feel like geniuses in a ‘down’ market and suckers in an ‘up’ one. One last point – our wealth has no value to us when we’re gone. We have no kids. In this situation, we have the opportunity to use our rental property during our most active years for the recurring income we need, and we can deplete our liquid assets slowly over time for the bucket list and unforeseen expenses. I want my net worth to go down before I do. Hopefully I’ll live long enough to start selling and donating all of our properties in anticipation of the dirt nap. I’ll know it is time when all of my frivolous expenses start to disappear. Saw your name on MarketWatch earlier today. Go Sam. It was of many suits by the same person against numerous homeowners of a condo, over several years, who never won a case against any of them. You can file a suit against anyone yourself for $300 or so. Not much chance of losing, but talking to the attorney I got a first hand look at my exposure. He said all assets not legally “free from attachment” are always exposed to civil litigation, and there is pretty much no way recategorize once it starts. That condo wasn’t my primary residence, so that was first on the list, etc. He said even though it is supposed to be a “jury of your peers”, they may not be good peers if you have more assets than average. No actual loss for me, but it was an awakening. Didn’t have an umbrella policy, but sometimes that becomes a target that causes litigation anyway. Someone can always ask for pain and suffering in the millions too. Since an actual experience like this is so infrequent, not may people wake up on the exposure, and maybe part of the legal profession likes it that way. Med schools teach doctors how to mitigate this. It strongly depends on the state you live in, but you have to know rules there. I am 50. Got it. Sounds like life has been kind of difficult for you. Glad you didn’t lose any money. For haps this is your second chance to get a umbrella policy and protect yourself. Have you retired or are you still working? Self employed now, engineering consultant. Less money than in corporate life but MUCH happier. Business keeps growing. I could plunge into supplying materials, and take more of a risk. I can definitely relate and really like your articles. They give me confidence. I amazed at the way my friends in corporate life still think about the world. They are stressed and entitled at the same time, while I forage on whatever I find, unrestrained. I hate to bring this up, but feel I should. Retirement accounts tend to have more legal protections that regular after tax accounts. A 401k is Federally protected, IRAs vary by state, and after tax varies by state, but typically has fairly low thresholds of protection. I live in a 1% fault state, which means when multiple parties are involved (think multi car pileup with injuries), people can be forced to pay not proportionate to damage, but proportional to ability to pay. This can go well beyond insurance limits. Look into the various asset protections doctors use, since they are typically the most exposed to litigation. Remember, once you get pulled into litigation, its way too late to do anything about it. Can you share your experiences about getting pulled into litigation and what happened to your finances? Did your car insurance, home insurance, and umbrella policy not protect you? Great post as usual. Really helpful to get some hard numbers and different options based on aggressiveness. 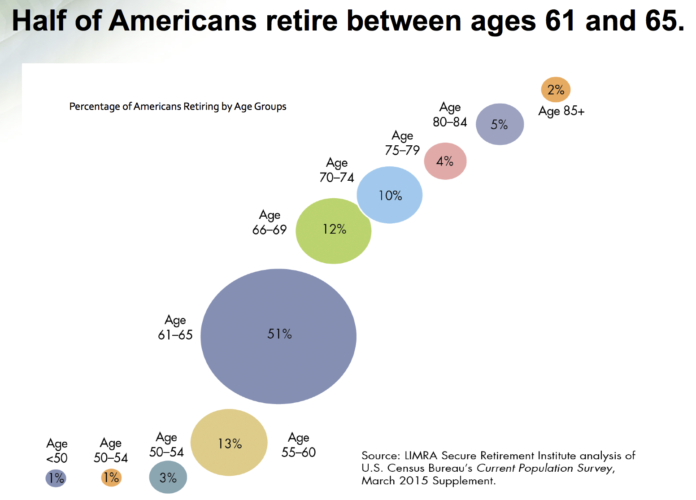 I particularly love the chart showing how half of Americans actually retire between 61-65. Sometimes I find myself in a bubble of “Retire Early content” where I assume everyone has F.I. on their mind. At work, there is even a Financial Independence group! I wonder if in 20 years that graph will change a bit as F.I. becomes more and more popular. Thanks. Early retirement definitely is a bubble. My fear is that I write about early retirement and then people think it’s easy, or don’t know the downsides, and then just blow themselves up without doing the map. It’s not easy to get to these numbers. But I really think people need to get to these numbers in order to not have a mental breakdown once they retire. Did he say dumb down? Sorry Andrew for not being at your level of intelligence. I only have a bachelors and an MBA, maybe I should have gone for the PHD. Financial Samurai – haha any regrets of leaving early. I think my wife wanted to leave ten years ago but I think we were always in that one year syndrome you mentioned especially with my disorder. Now her company transferred a lot of her work to Southern California so we are hoping for a lay-off of package. I purchased your book on negotiating a severance so I am going to reread it. I am so totally confused by these charts. First why would you need more as you age to retire early? I think it would be less. And why would you need more in your after tax accounts at age 60? I would think you would need less because you only because you don’t have to take RMDs until you reach 70. I am 65, retired because of a disability, I receive 24,000 dollars in Social Security annually. My wife is 62 but will retire next year at the cobra window. We have $1,100,000 in after tax money, and $2,500,000 in pre-tax 401Ks, and IRAS. Where do we stand in your tables? Maybe I am reading it wrong. This post is for people who want to retire way before 60 (retire early). Because “Retire Early” comes towards the end in my title, perhaps you missed it. Given people want to retire early, these people need to build up after-tax investment accounts to earn passive income to survive. Regarding the large net worth figures at the end: Getting to $10,000,000 – $20,000,000 by age 60 in my charts seems farfetched. These large figures should give folks some insight into the power of compound returns over time. For those who are willing to retire at let’s say 40, their net worth will likely be capped at around $2,000,000 – $3,000,000 or at least grow much slower as they spend their passive income and potentially their principal. I think having $3.6M dollars is pretty good for you guys at 65 and 62. The question is: do you have any regrets retiring in your 60s? If not, all is good. I knew in my mid-30s that I would regret not taking the leap of faith because I was bored and tired of the work. So I left. If you have any tips on how to make the post easier for you to understand, I’d love to hear them. I’m sure you’re not the only one confused, despite my best attempts. Perhaps a summary of the key points in the beginning with more emphasis on early retirement in the subtitles? I should make the post shorter too, but then people miss out on the details. But then, people don’t bother to read the details in longer posts. Hmmm. Suggestions welcome! I am impressed how you continuously explain over and over again to readers what you have already written in your post. That must take a lot of patience. I for one don’t want you to dumb down the post too much. It is interesting to see however the people aren’t willing to thoroughly read before commenting. You might want to just ignore or deny the comments all together to save yourself time and hassle. If people don’t understand, then I’m not writing clearly enough, and that’s on me. I spoke to a couple Teachers, and they said it’s best to only move as fast as the slowest student in the room. Otherwise, they will be leaving kids behind, and that’s not fair to them. So it’s a great balance between providing enough detail for substance, and writing short enough content that’s entertaining that gets the point across. My plan is to write longer content and then shorter posts to mix things up. Thanks, Mark, for your comments and questions. I, too, was a bit confused. Sounds like you’re on track for a good retirement. I’m on target! I don’t hold any equities outside of retirement and 529 plans, but I’ve got real estate investments for my after tax investments. I have a separate account for my real estate and reinvest 100% of the income, as I mentally allocate real estate investments as my early retirement plan. Plus rental real estate provides a nice current tax benefit between depreciation and expenses. I allow myself/family to spend my paychecks since 401k and 529 contributions are taken directly from paychecks, and real estate income is a separate bank account. My spouse is a spender, so we still “get” to live paycheck to paycheck, but not really. The data in the chart titled “Half of Americans retired between ages 61 and 65” adds up to more than 100%. Also the age group 50-54 is listed twice which may explain the >100% total. Interesting chart nonetheless. Can you provide URL to the report which produced it? I would like the read the source material. F.S. dropping down the gauntlet again! Just when I meet & exceed the “average network for the above average couple” I see this! Now I see I don’t have nearly enough post tax and looks like I never will. Darn. But Networth targets appear to be on track. After tax savings is tough! This year is the first year @28 that I fee I have gained momentum here. Going to be tough to catch up to tax advantaged accounts by 30. The good news is those are healthy. I guess mental accounting can paint the picture that after tax could be the same as taxable. We are looking to buy property 2 and rent out our first so that immediately juices the after tax picture as you described it. Regardless the name of the game is put it away. It feels awesome to load a brokerage account and save for a down payment. I am secretly crossing my fingers for better RE deals to come, we will see. I’m between the regular and conservative charts. I agree the focus should be on after-tax if you plan to retire early. I don’t have plans for that. I like what I do enough to continue working for the long-term. In my opinion, no one (or maybe a teeny tiny tiny percentage of people) LOVES their job, that is a myth. We’re 40 and 41 and live in the Southeast but are sadly no where near these after tax account #s. We have about $175K in after tax investment accounts and cash (and another $175K in 529 accounts for 3 kids) and $550K in retirement funds + a state pension of about $12K per year. Home equity is about $450K – $500K. DH went to law school and has been working for 16 years so if I look at even the low cost chart we should have double the amount in after tax accounts than we have. We’ll keep plugging away. That state pension…. how much will it be paying in 10 years? Could be a real key wealth booster. People underestimate the value of their pension, especially private sector workers who don’t have one. Instead of following by age, follow by years worked. Check out the third chart I created for those who live in low cost areas and plan to retire in low cost areas. Once you have your housing down, retirement life doesn’t cost much at all. Woah only 1% of retirees are younger than age 50. For some reason it makes me nervous looking at it from an eagles view, there’s more people working to their 70s than quitting before age 50. We have a medium to high amount in our retirement, barely touching the high end because we didn’t know personal finance out of the gate and lost some time there. Supplemental income is key – every $10k a year made extra is same as $250k saved. As a hopeful early retiree at 45, I’m very far away from the 3M mark. While I still have a 6 years to go, I will, without a doubt come up shy. Starting late along this journey is a tough handicap to overcome. It’s sobering to read, but you’ve detailed some great benchmarks to aim for! Now I just need to figure out how to add 1.5M to my net worth in 6 years. Sadly, just saving 166k a year isn’t currently in the cards. You might find that you won’t need $3M. It all depends on where you want to retire and your overall expenses. There are three charts to follow in this post. Make adjustments based on your own situation. We are in an odd case. My wife and I have 2x our retirement investments as our non retirement investments. If you add the equity in our home, it gets closer. Being that we live and work in the NYC area, and have those costs and incomes, we plan on retiring in a lower cost region of the US. We also will want a warmer region! I’m not quite done with the snow yet, but each Nor’Easter brings me closer. The other thing is that we calculated our comfort level at about $3 million to $4 milllion to allow us to retire. That’s probably on the high side, but we are older with a younger son. That puts us safely in that range in the 10-15 year range depending on market results. Obviously, much sooner if the market does really well, but who can predict that? Bingo! Moving, because you can, once you retire early is a no brainer to extend one’s finances. Such a huge country with wonderful places to set up the next stage of life. The good thing about change is that even if the markets take a dump and the economy goes into a recession, you will have the ability to make adjustments to make things work, provided you have a plan and disaster insurance. Nobody is just going to just sit there and let life beat them up! You are not alone with more pre-tax savings vs after-tax savings. I guess with two kids approaching college age (private institutions), you would have spent a lot more of your after-tax dollars regardless where you live. I would not be surprised many middle-aged parents fall into the same category like us. On the other hand, I understand the premise of this article is about early retirement and the table seems to make sense. Sometimes I think I am doing really well. Then I read this and I am sad panda. It is hard for me to envision how to go from $450k at age 35 to $1.5MM at age 40. Even if you factor in a 10% return (say 9% after tax), that’s $135,000 you have to save every year. I don’t think many can dream of saving $135,000 a year (and maxing their 401k). To do so, even on a bare bones lifestyle, you need an income of $250,000 or more. Which is just hard to do outside a couple fields. Even for me, who is in one of them (engineering) you can’t make $250,000 in the Midwest where I live. Silicon Valley pays this, but in the Midwest, making $150,000 is pretty darn good. Top 5% for sure. Good news! Check out the third chart I created for those who live in lower cost areas of the country. I was trying to tell people to make a judgement call about the charts in point #6 towards the end, but I decided it’s easier to just create a more conservative chart to follow. Great article Sam. I’m 45, married with 1 kid and have about 3.3M total excluding home equity with about 450 of that in pre-tax accounts. A couple years ago, I left a job I hated for a lower-paying job in an industry I’ve always wanted to try (and in a lower cost city). At this point, I’m kind of ambivalent. Working at a traditional office job is pretty limiting in terms of flexibility and autonomy. Still have to deal with corporate bs, etc. On the other hand, Im also ambivalent about early retirement. While it’s very doable given the numbers, we’d have to cut some luxuries that we enjoy such as frequent travel and eating out as frequently. My wife really seems to miss NYC (where we used to live), and if that becomes a priority there’s no way early retirement is possible. Some sort of work-at-home side business would be ideal, but I haven’t hit on any niche/idea that I like (whether that be a blog, business, etc). Your blog continues to inspire me however. Do you pay off your primary house yet or you still have a mortgage Sam? I’m curious what your thoughts are on the same numbers for folks that have children in their 20s or early 30s. I feel like FIRE types who make these decisions while flying solo are making decisions that feel certain, but lack vision for what life with a spouse and/or children might look like. I saved aggressively in my 20s pre-kids, but my spending and saving certainly changed profile with kids. When Jr. is 3 years old…that’s it. You can’t run it back with Jr. later when you have more money. That trip to the park, to Napa, to the snow, to meet Mickey Mouse or whatever interests you takes on a level of urgency that nothing else really matches. I probably land on the low end of your aggressive ranges simple because I choose to maximize time that the kids are home and still want to hang with dad. I think it’s a wonderful trade to make. I do believe there is a lot of “feelings” and subjective decisions made for those who pursue FIRE. Therefore, I wanted to put out some hard numbers using a 3% – 5% safe withdrawal rate to save people from themselves. Pls elaborate on your “when Jr. is 3 years old.. that’s it” meaning. Does this mean you’ve found kids to cost much more? There’s nothing more amazing that kids IMO. So that value of time spent with them is priceless. Kids are FIRE dampeners no doubt about it. Hard to retire early and have kids. But kids provide a tremendous amount of motivation to get one’s finances, health, and life together too. Kids certainly cost more than not having kids, but I meant to point out that if you want to take your kid to the snow at 3 you only have the chance during that one winter. It may only be a few free weekends or in budget for one. Kids add a lot of urgency in the demands they place on your finances. You can’t just do it next time or next year. It’s all over in a flash. That said, I like putting numbers to it and being honest about how exceptional it requires your saving habits to be in terms of the general population. I like the thinking and goals behind FIRE, but you have to love the journey. Interesting article. Given that I live in CA, I don’t think I could have saved as much as you noted in the above charts. At age 30, my pre-tax worth is about $250k. My after tax is about $20k. This was because I focused on trying to reduce my tax burden and after that the cost of living here in Cali eats into my ability to save after tax. I know they are guidelines and I am not arguing that. The math makes sense as to why you wrote what you wrote. I guess I am saying given my situation, it would have been hard to achieve those numbers unless I made a ton of money of crypto or worked a higher paying job in finance. (I’m an engineer FYI). It does make me wonder, if I found FS 10 years ago how much this could have been different. Or if I lived in another lower cost of living state with the same salary. But so is life. Good to have resources like FS around to help steer me. At age 30, a $250K pre-tax amount is GREAT, and $100,000 higher than the mid-end guideline. But I think you would agree that only having $20K is not going to cut it if you want to retire early. Hence, I would aggressively focus on building the after-tax accounts over the next 10 years. The thing is, if you don’t want to retire before 60, then the after-tax numbers aren’t very meaningful because of your paycheck and benefits. The after-tax numbers in my chart are really to help people avoid blowing themselves b/c early retirement is the trendy thing to do. There are a lot of costs associated with early retirement that people forget… namely health care costs. We pay $1,750/month for a family of 3 for example! Why not include home equity in post-tax or at least “home equity minus transaction costs”? I have $401.7K in pre-tax retirement accounts, $278K in Roth Retirement accounts, $20K in money market/cash, and $430K in home equity and am 37. But I’m never going to achieve your post-tax ratio if I keep maxing out my retirement accounts. But I’m right within the middle range it if you count home equity. For the early retiree, it’s all about monetize the after-tax investments for income to live off of. So if you can rent out rooms in your house, or rent out your house while you travel, then your primary residence can definitely count. Thanks. My thought is that I will sell my primary residence at some time in the future and pocket the gains when moving to a lower-cost of living area. I live in Yerba Buena by the Metreon. I look at it a similar way. When I’m not working anymore I will be out of NY as fast as humanly possible. I figure the places I actually want to live I could get the same house for ~40% less than NY prices. So I count my home equity and figure I would get about 50% of my home equity out when I move just because of the home price differential. At 33 years old with a 1-year old at home though I have at least 10 years of work left realistically. So it’s mostly an academic exercise for now. 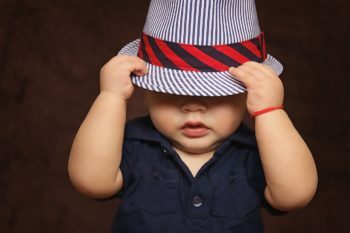 Big ups to Baby Samurai for rocking that porkpie like a boss. Little Dragon comes correct, two-hands on the brim and tug forward. Where do y’all think the 457 fits in this? On one hand its a pre-tax vehicle for saving, so the answer seems obvious, but on the other hand, there is no 10% early withdrawal penalty or age restrictions on withdrawals once you leave employment. My after-tax savings would be higher if not for the fact I contribute to a pension, max a 401k, and max my 457 each year. One thing I haven’t seen discussed in these articles where assumptions are made around maxing out pre-tax contributions is the limitations put on highly compensated employees (HCEs). My annual contribution limit to my 401k is not 18,500 like these charts show, but 5,500. I can’t be the only one on a site like this who’s impacted by this regulation. I’m sure others face the same limitations, in which case, simply focus on the after-tax investment column as your guide. Early retirees who follow my guide don’t touch the pre-tax amounts before 60 anyway. The pre-tax amounts should be considered bonus money to help folks proactively build their after-tax investments for passive income in early retirement. Yes, and I do, but this obviously comes with a significant loss of employer contributions, tax-free contributions, and tax-free growth. It seems like a site that is more tailored to high earners (the HCE threshold is not very high) and that so thoroughly covers maximum saving across all available means would address this situation. The assumption made in most of your savings articles is that everyone puts the maximum amount away in their 401k. My wife and I are also impacted my HCE. Been working for about 32 years and we could never maxed out until the recent years. In the beginning, Our salaries were too low and we were subjected to 10% or 15% max contribution depending on salary levels. 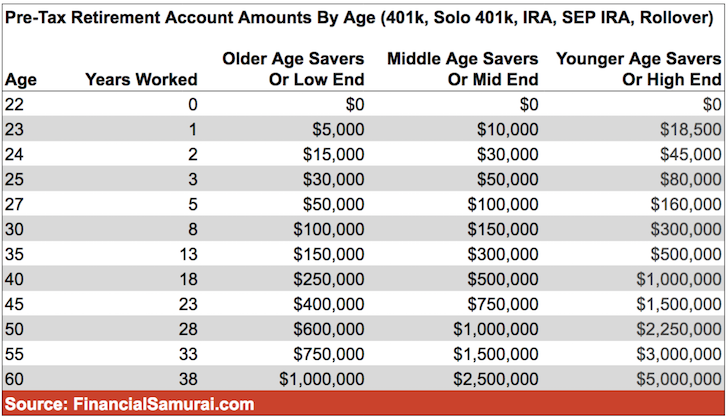 My 401K amt is no where near the middle column of the 401K chart in this post for our age. Our goal is to reach 1 mil in each 401K account by age 60. If you are willing to work until 60, then you are free to focus on the pre-tax amounts guide. These are simply goals to work towards. Wife is retired at 51 with a pension. She has 900K in her 401K invested in fixed dollar 4.3% investment. I just crossed the 1Mil mark in Aug and I also have my entire 401K in 4.3% investment. I will retire at age 55 but we will leave our 401Ks in the company and just let our money compound at 4% plus yearly. By age 60, each of our 401K should reach 1.1 to 1.25 mil each. Very good article, but I’m a little confused. This analysis and amounts for after-tax accounts doesn’t align with your long standing article “The Average Net Worth for the Above Average Person”. As I turn 55, this week and use your articles as a benchmark … I was feeling good and looking forward to retiring in 15 months (1/1/2020) is my date …until I read this article :-). When I read “The Average Net Worth for the Above Average Person” … I’m exceeding the “average” net worth of your 65 year old … aligned with the pre-tax savings of a 60 year old and exceeding the post-tax savings referenced for a 65 year old by more than 2 fold and own my home with equity of ~550K. However, when I read this article my “get out of corporate jail card” started to self destruct when I saw that I should be upwards of $6.25M in “after-tax” investments, excluding home equity for a guy at 55. Tell me it ain’t so ! Due to inflation, everything has gotten so much more expensive just six years later. Home prices in some parts of the country are literally 80% to 100% higher. But that’s for younger folks to stress out about. Don’t worry, you still get your get out of jail free card at age 55 based on your numbers. These charts aren’t as meaningful the closer you get to 60. The people who are able to retire early can basically live off a 4X multiple of pre-tax retirement accounts at age 40-45. And when they leave, their net worth will slow down or to be capped at two to $3 million. But since you are 55, you are more secure than the 40-45 year-old because you only have to cover for 5 to 7 more years until you can type your pretax retirement accounts and Social Security. There’s 15 more years for something bad to happen to the 40-year-old, so congratulations to making it to 55! Also, since you are 55 years old, you should use the low-end column of the pretax retirement account chart and multiply by 4X. That number should be closer to what you got. I’ve added a conservative after-tax investment amount chart towards the end. I was noticing the same thing as DawgSaver. It seems like the post tax multiple of pretax gets less and less realistic the older you get. For instance if you had 1.5M in pretax accounts you would need 4.5M post tax at 3x with 1.5M in pre-tax for 6M total at age 50? That sized portfolio conservativly supports 180K pretax spend alone with a 3% SWR… or 300K with a sketchy 5% WR. Perhaps an article about the tax implications of early retirment with a discussion around why pretax amounts are key is indicated? Getting to $15,000,000 – $20,000,000 by age 60 in my charts means plenty needs to go smoothly with your job, your investments, or your business. For example, to grow your after-tax investment amount from $5,000,000 to $15,000,000 in 10 years requires annual contributions of $115,000 plus 10% compound annual returns. You don’t need to accumulate so much money at later retirement ages in order to have a comfortable retirement, simply because you have less of your life to provide for. You will also have a much higher pre-tax retirement amount to quickly draw from. Instead, these large figures should give folks some insight into the power of compound returns over time. As a result of compounding, I really think it’s a mistake to retire before the age of 40 if you don’t have alternative means to earn and invest. Earning your 5th million is much easier than earning your first. At 41, I feel like my life has just begun. Finally, for those who are willing to retire at let’s say 40, their net worth will likely be capped at around $2,000,000 – $3,000,000 or at least grow much slower as they spend their passive income and potentially their principal. In other words, if you retire early, it’s likely you will give up millions of dollars of future wealth for the freedom you’ll enjoy today. This is the choice almost all early retirees have mentally come to grips with. I want to show what’s possible, and what early retirees will potentially give up financially if they retire too early. The sweet spot I think is 41 – 45. If that’s the case, we’re talking after-tax amounts closer to $2 – $3M instead. Feel free to argue otherwise and share your background story. Great article! One question about your pre tax retirement chart. Why does the amount for high earners double between 35 and 45 but not for middle and low income earners? Higher earns tend to have higher company profit sharing matches. The total 401(k) contribution between employee and employer is $55,000 as of 2018. When people get excited about a 3% – 10% match on a $18,500 contribution, it’s because they don’t know that their employer can literally contribute up to $36,500 a year to their 401(k). Profit sharing can be very, very lucrative. With roughly 5 years of work experience under my belt, I’m in-line with your mid-to-high retirement progress for pre-tax and after-tax accounts. I don’t have intentions of retiring early but it is nice to have guideposts against which to compare in case I ever have a change of preference. As I always say, I want to get invited to the dance even if I don’t want to go. Personally, I’d be afraid to retire before my kids finished school. I know building a diversified passive income stream would be a great way to offset that risk, but I’d still have a fear of needing to liquidate my nest egg to provide for my family in times of uncertainty. Maybe with time and dedication to building a passive income stream, I won’t worry as much. Over the next ten years, my intention is to build this to cover our annual budget. Good timing on this one. I’m trying to wrap my head around a windfall event we just had. I’m 35 years old, with a wife & kid, and just sold my e-comm biz (solorpreneur) for 7-figures. Thank you Amazon FBA! Before the business, I was already a corporate career dropout, turned stay-at-home-dad, with an intuition towards FIRE (it didn’t hit my vernacular until later). The aggressive saving we did in our 20s, along with our frugal spending, set us up for me to leave my 6-figure job at the end of 2014 and take some risk. My wife kept working and bringing home the health insurance, and although our savings rate took a hit for a couple years, it allowed me to go all-in on the business venture. Well let’s say half-in, after all, I’m a stay-at-home-dad! Fast forward 2.5 years and here we are with $350k in pre-tax retirement accounts and $1.2 million in CASH! I’m still in shock. I’m letting the dust settle to try to normalize this big sale that just happened. I certainly don’t want to rush into anything with investing it. I’m actually happy to hang on the side lines with measly money market returns and no risk for a while. Maybe that looming 10-year correction might work in my favor so I can buy into the market cheap? Or maybe I’ll regret hanging back for so long. And ultimately, that’s my issue. What degree of risk do we want to take? I just caught up with our CFP about this and it’s funny how quickly our planning went from previously “aggressive” (since we’re young) to a more “capital preservation”-like approach. As it stands, we have way more than 20x our annual spend rate (especially with my wife working). I never intended to stop working all together, so although this plan can technically allow me to fully retire, I don’t want to stop being financially productive, and I don’t want our financial future to settle at that either. The preservation approach looks very safe, but it is a piss-poor way of taking advantage of our age and potential of the stock market! The risk taking entrepreneur in me is looking for a hybrid approach. Do I go the risk free approach and sleep easy? Meanwhile keep at the side-hustle activities and build something again (might not have another “home run” in me). Take more risk with the investment planning and let time work its magic and compound this nut?! Ooof…Biggie Smalls was right, “mo money mo problems” ;-) Thanks for creating a forum for vetting these “problems”. Just looking for some wisdom from you and your readers! In my opinion 35 years old is way too young to switch to capital preservation mode. If you want to give yourself some optionality though you can get a 1-year CD at Ally bank right now paying 2.5% interest. You could throw $500k in there and then invest the rest in the market. If the drop comes you’ll have $512,500 next year to invest at better prices and if the drop doesn’t come you’ll have made a good return on what you did invest in the market. If you’re planning to still work and your wife isn’t dying to quit her job then you can definitely ride out the market volatility. Life can change and having a larger nest egg down the road gives you more flexibility. And if you end up with way more than you need that is not a bad problem to have and you can find some great charities. Congrats! Gotta love taking some risk and having things pay off. I’d love to know your thought process behind why you sold your business and what type of business bought your business? I’ve taken the stance that one should never sell one’s cash cow, especially in a low interest rate environment. Valuations for online private businesses are still so much lower than the S&P 500 P/E valuation, for example. Perhaps a guest post on how everything came to be! Amen, on the early retirement with a working spouse. My wife is the cash cow with benefits and her valuation is pretty high! Sorry I went silent this past week! Since the business sale, I’ve gone off the radar and back to immersive stay-at-home-dad activities. I sold the business for that reason, among others. My little guy’s naps are getting shorter and his developmental needs are much greater…the same was going for my biz too. I started it as a side hustle and it grew to be substantial in 2.5 years. I didn’t feel like I could sustain the growth rates or even maintain the velocity as there was lots of competition nipping at my heals. The business was very Amazon dependent and so the cash flow didn’t feel reliable, especially as my energy and passion were waning. One of the core principals to the venture was that it would be very low stress, low overhead, with no employees, so I could do my #1 job as Dad, but that got complicated at 7 figure revenues. I never expected it to do so well, but as you know, you just have to set up shop and start plugging away. I really enjoy getting wins early on, and enjoy getting big ROI from brute force efforts. Things were getting to a point where I was was working on eeking out smaller returns on precision efforts. Not my cup of tea. That’s for the new owners. My wife and I are probably one of the most financially conservative couples on this blog. We have NO money in the stock market. If your State is financially strong then I would buy individual Municipal bonds. Currently 4% munis are around PAR ($100). 1.2 mil at 4% will generate 48K Federal and State tax free every year. We have been buying Munis since 2010 to prepare for layoffs. We become FI at 49 and we are now 54. My wife retired at 51 with pension and I will retire at 55 to collect my pension. We currently have 2.5 mil in NY individual Muni bonds and they generate 104K a year which covers 1.5x our expenses. We sleep very well at nights since we don’t have to worry about the market. Let your pretax money ride the market. Invest new money in the stock market if you like but I would Protect this 1.2 mil financial nut. Since life always throws a curve ball, we plan to have passive incomes from munis, pensions and 401K interest to cover 3x expenses not including Social Security. Each stream of passive income will cover yearly expenses so that if we lose 1 or 2 streams of income, we would still be financially OK.
I’m curious about those munies, as I am looking for more diversification. By what method do you buy them? Do you have to hit a broker? After years of buying municipal bonds, we learned that banks and brokers charge 1% to 2% more per muni bond compared to self service brokerage like Fidelity. fidelity only charges 0.10 markup. Citibank charges 1% and HSBC charges 1.75% markup. For example, a muni bond at Fildelity may cost $100 PAR but it would be $102 at a bank. We no longer buy bonds via a bank or broker. We NOW only buy our munis in Fidelity and will transfer the money from the banks when the bonds there are called or matures back to Fidelity. Sam wrote a great post on zero coupon muni bonds which pays interest and principle when a bond matures. This would be great if you don’t need yearly income and maybe saving for a future event. I like MTA (mass transit), water, Dorm Authorities for schools and hospitals. Make sure the school and hospitals are well known. People will always need these facilities. Bonds will vary from state to state so buy what you know in your state. 3. Tax exemption. Make sure it is totally tax free. Check the bond details. 5. YTW (Yield To Worst or Yield To Call) greater than 3.75%. In a 33% tax bracket, it is like a 5.7% CD. YTW is the min the bond will earn when a bond is called. Most bonds are callable after 10 years of being issued so I dont really pay attention to maturity date. Bond prices are currently dropping so I like to buy bonds in x amounts. Dont spend all your money on just one bond. Currently, I can buy a 3.85% NY Muni bond at PAR ($100). I check Fidelity almost every day for muni bonds for my State for any good buys. In the end, just be happy with the yield and dont go crazy if the bond price drops. If you hold the bond until it is called or matures then you will get the face value back to avoid lost of principle except for the premium paid. 8. Call dates, mature dates and month interest is paid. 9. Price of the bond. Try to buy bonds at face value of $100 (PAR) or less. If you have to pay a premium then pay at most 1-2 dollars. For example, a 4% bond at $102 will take 6 months to break even. When this bond is called or matures, only the face value is returned to you. If you paid a premium then it will result in a lost of principle. This is not a big deal if especially you are happy with the yield and the interest you received. In Fidelity, I do a search for a min YTW of 3.5% in descending order to see the highest yields at the top of the list. Click on the YTW column on the search results page to sort them. Once you get the search working save it in Fidelity and book mark it in your browser! I use the browser book mark everyday to check for new listing of munis. -Select your State. If your State is tax free like Florida then you buy muni bonds from any State for tax free bond interest. -Click on “See CUSIPs” button at the bottom of the screen. -On bond listing screen, click on the YTW heading on top on the column to sort it in desending order. Now you will see the highest yielding bonds at the top. You did not mention the coupon. Is this an important factor to determine which muni bond to buy especially when most discounted bonds have very low YTM? It seems in order to get a high YTM, you’ve got to pay premium. Any thought? In the begining, we focused on the higher YTM. We purchased many muni bonds with the higher coupon of 5% over PAR instead of buying 4% bonds around PAR. We paid over 33K in premiums for these bonds. All of these bonds were called so we received the YTW amounts. You can see that I would be financially ahead by buying 4% bonds around PAR. I should have focused on the highest YTW instead of YTM. Lesson learned: Since many bonds are callable usually after 10 years of being issued, I will NO longer focus on YTM. I only focus on the YTW value since that is the min I will earn. I also concluded that I no longer want to pay such high premiums. The max that I will pay for a bond is $102, the min coupon would be 4% and YTW must be greater than 3.5%. Higher premiums will reduce the YTW values. That is why it is extremely important look at the Yield To Worst values. Don’t let the higher coupon rate fool you in thinking the yield is higher than lower coupon bonds. If my bonds were not called then of course the YTM for my 5% bonds would have been higher than the YTM for the 4% bonds. In the end, you just need to review the numbers and be satifisied with the interest earned. “The max that I will pay for a bond is $102, the min coupon would be 4% and YTW must be greater than 3.5%.” is rather difficult to achieve unless you are willing to buy lower graded bonds. I’d love to learn where you can find those jewery in the current environment. I typically buy non-callable bonds and thus YTW is equivalent to YTM. In current market, would it make sense to buy high-coupon rate bonds and invest coupons to new bonds whose prices are going to be lower assuming the interest rates will go up for another 2 year and you are luck to find a short-term bond in the secondary market? I just want to thank you both for this primer. It’s really a big help to me. I will explore this further, but again, thank you! My NY Muni bonds ratings are mainly as follows and I don’t consider them low grade. -I have a couple of Medium grades-BBB. I have been buying many muni bonds under $102 YTW>3.5% since 2013. Sometimes, it is difficult to buy a 4% or great coupon but when I have cash sitting around, I buy the best yield at that time. I do have several bonds under 4% but I am happy with the yield at purchase. At this very moment, there are many NY muni bonds available with a coupon of 4%, YTW>3.9% around PAR rated A3 and higher. Do the search for yourself if you have a Fidelity account. In the end, everyone needs to buy whatever makes sense to them. I can’t find any good NY non callable munis with a good yield so I buy the best YTW. So far there are only 5 listed for NY in Fidelity and YTM is 3.9ish but WAY over PAR $119+. No thanks. I will stick to my criterias. I like the guidelines and it does apply to the wider audience as a whole. As a physician it is tougher to hit the thresholds because we basically start out late with some of us having a lost decade or more of earning (and even worse accumulating debt due to medical school) that puts us behind the 8 ball. We of course make up for it with typically higher than average salaries once we do start work as an attending, but that decade of lost compounding etc does take a bit of time to make up. For me I will never make it based on the numbers you have listed for my age because lately I haven’t been adding to my taxable brokerage account but instead investing it in passive income streams (solely private syndication multifamily commercial apartments) that in my mind lowers the amount needed in a taxable brokerage account. You didn’t mention the Roth conversion ladder route as an option, and that is my current plan. My target for after-tax investments will be 5 years of expected retirement costs, which is about $500,000. Then during retirement, will do the 401k -> Roth conversions to cover the next 10 or so years until age 59.5. That’s a lot less than your charts, but as a high-earning dual income family, saving $2.6mil in taxable accounts sounds difficult and full of taxation. I’ve been focusing on maxing 401k accounts for so long that there is and will be plenty in there to work with. So doing the conversions to get to that money earlier is worth it for so many reasons. I turn 54 on December 30th of this year and plan on taking the “somewhat early-looks like top 20%” retirement option early next year and will use the rule of 55 to start 401k to Roth conversions at that point with no 10% penalty. Even though I have after tax investments, I will take out just enough to keep at maximum 12% adjusted gross income tax bracket and convert to a Roth to use later down the road and hopefully continue to do so as long as possible! Just to clarify, you can convert the 401k to a Roth at any time without the 10 percent penalty. Just have to pay your income tax. Whether you wait until 55 to do this should be about your tax bracket. You can withdrawal from either your 401k or your Roth at 55 with no penalty for other uses provided you retire at or after 55. I plan on retiring at 55, so my accounts are tilted towards tax deferred (Roth and 401k). Something else to consider, there is a tipping point where savings on cap gains and tax brackets from a 401k or Roth beat even paying the ten percent penalty. Just a reminder, if you convert a 401k to ROTH to avoid the 10% penalty you must also wait 5 years to tap those funds. >> Just a reminder, if you convert a 401k to ROTH to avoid the 10% penalty you must also wait 5 years to tap those funds. If I read the information at the following link correctly, this statement wouldn’t be so IF one has had a ROTH for 5 years already. Depending on where you live in the country, it looks like a 4x multiple or higher is the sweet spot for early retirement with a bit of cushion. If you had to guestimate what percentage of your after-tax investments are in liquid securities like stocks, index funds, etc what would you say it is? Just trying to get an idea on how much your rental property and business investments account for the after-tax account value. Great post. It’s pretty straight forward. If my after-tax investments = 4X my pre-tax investments, then my after-tax investments account for 80% of my net worth. The goal is to not only max out the pre-tax retirement accounts, but make them seem as insignificant as possible when it’s time to finally retire early. People will surprise themselves with how much their investments can grow over time. It’s shocking how compounding really makes people rich. Sam, if you didn’t have blog income would you be reinvesting dividends/cap gains or would you use that income for your expenses? Because my severance paid for 100% of living expenses for 6 years, I would have reinvested 100% of my passive income/cap gains into the market in 2012. If I didn’t have a severance or blog income, I would have spent ~50% of my passive income ($80,000) because my wife, who was 31 at the time still had a job. I wouldn’t have left work at 34 if I didn’t get a severance. I would have kept on working for 2-3 more years. It is OK to take some risks with a new job that pays less, start an entrepreneurial endeavor, or even completely retire. Great straightforward numbers-based post Sam. In the statement above, I’m doing the second. And I’m only semi-retiring to a part time status so I can keep my health benefits. I never had a safety net in life to start a business, so I never had the ca-hones to do so. Failure was not an option. Now I can play with businesses and if they don’t work or don’t make money for a while there’s no pressure. Financial Independence is an amazing tool! I have a question regarding consolidating investments. I have my 401K in fidelity through my employer. Also, I have some investments in Vanguard because of their low cost funds, Wealth front (as per your suggestion a year ago and so far I am happy with it) and also one small account in T row price. The fidelity person is giving me free advice on retirement investment as per our company plan. He is asking me to move everything to fidelity so he can give me better investment options, I am little hesitant about this. What do you think? I really value your opinion. I think you should compare the returns from each portfolio after the costs, and then make a decision. I personally don’t like having all my investments with one firm, although Fidelity is a good one with a great platform.